100% Cotton. Warm and cozy pajama pants. Various plaid pattern. One button fly. Adjustable drawstring waist. One pocket on each side. Waist : S 28-30", M 32-34", L 36-38", XL 40-42". Inseam: S/M: 30", L/XL: 31"
Add Casual Trends Sleepwear to your bedtime favorites. With many years of experience Casual Trends is now the king in all areas when it comes to Pajamas from comfort to durability and pretty designs too. Casual Trends has spent many years of research in every inch of the pajamas to bring you comfort sleep. 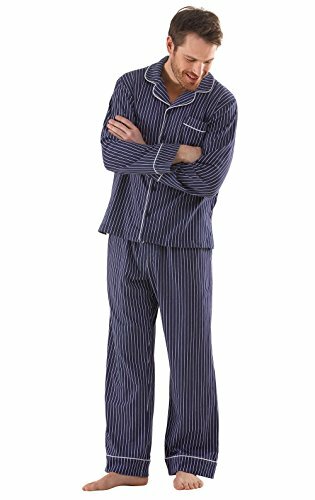 A light, thin & comfortable mens pajamas set crafted from a fine cotton/poly blend. Styled with lined collars to retain shape permanently. Long sleeves and chest pocket. Button-down closure plus a button to close the open collar. Roomy, comfortable, shaped arm holes. Comfortable covered elastic waistband. Adjustable buttons for a perfect fit / snap fly. Relax without tightness! Fully wide cut for complete comfort. Some designs are also available in Mens Robes, to get your matching robe search on Amazon for "Casual Trends Pajamas"
Machine wash warm, tumble dry low, non-chlorine bleach when needed. 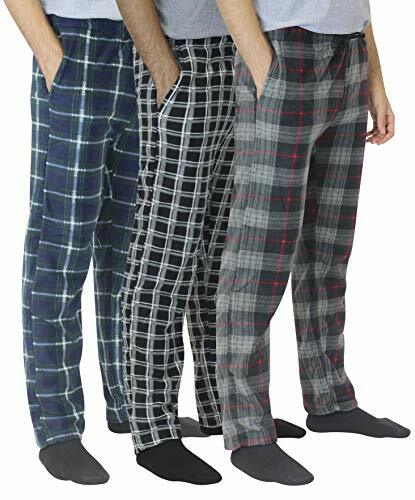 Real Essentials Men's 100% Cotton Knit Pajama Bottoms are comfortable, durable, and classy. 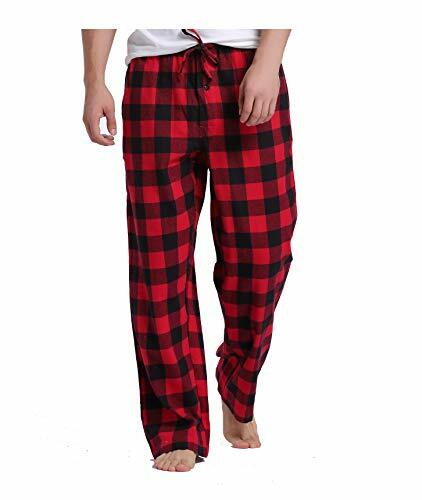 Made from premium 100% cotton, these men's pajama bottoms are cool and soft on skin. Designed with you in mind, our pajama pants are perfect for lounging around the house even when guests are over. Rich in features, these Knit cotton lounge pants for men will not disappoint. Enjoy the comfort of Cotton without the extra bulk. Our lightweight, cotton fabric is perfect for sleeping and lounging on cooler evenings. Soft to the touch and easy on the skin Real Essentials knit cotton is the perfect fabric choice for all of your sleepwear needs. On-seam pockets are a great addition to any garment because they provide the convenience of a pocket cleverly hidden in the side seam of the pocket. Let's face it - we all have different preferences when it comes to how our pajamas fit. Some like it loose, other's like it tight. That's why the go-to style for pajama bottoms is the elastic waist with a drawstring tie. The elastic waist helps the bottoms to loosely hug the waist, while the adjustable drawstring allows you to pull the bottoms as tightly as you like - ensuring a perfect, custom fit every time. You never have to worry about how your pajama bottoms will fit when you choose a pair with an elastic waist and drawstring. On Seam Pockets Perfect For Storing All Your Small Essentials. 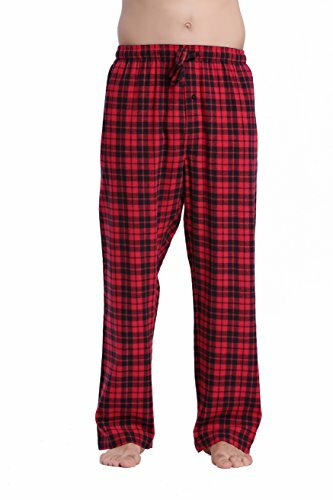 Perfect Gift: Pajama Pants Are Always Appreciated As A Gift -The Perfect Present For Your Dad, Husband, Brother, Or Friend. 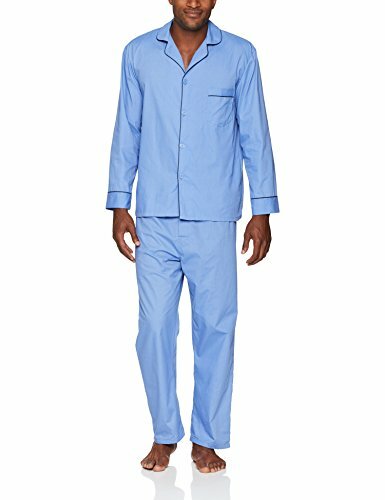 These men's viscose pajamas set from Latuza are comfortable, durable and elegant. 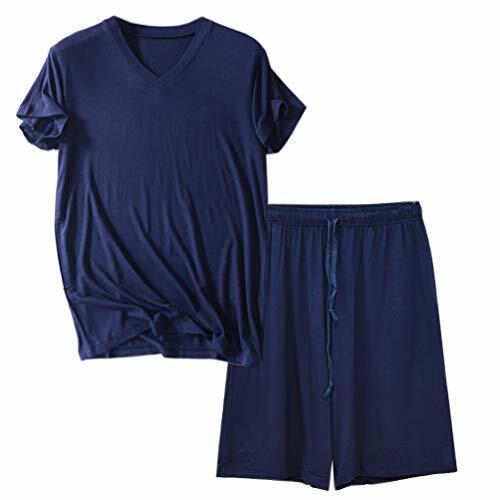 Made from high quality viscose, this men's pajama set is soft and easy on the skin. 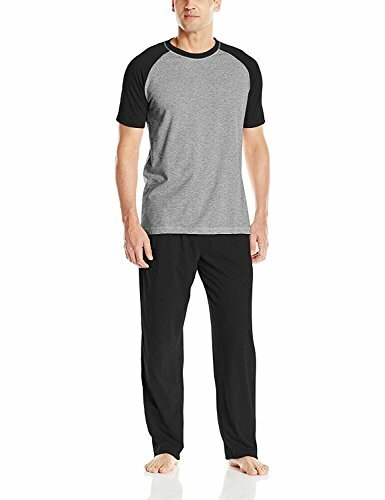 These men's sleepwear set are great for lounging around the house, nightwear, jogging, walking or for working in the garden. This classic Men's Pajama Set with a traditional print pattern is a perfect pair for feeling good and looking great at bedtime. The bold color and classic design offers a timeless look, and the comfortable knit cotton fabric is warm yet breathable, so you can wear them summer through winter. Two-piece PJs for Men have a chest pocket on the long-sleeve, button-up top, which complements the side pockets on full-length pajama pants to provide the function every guy wants when winding down. The elastic waist with adjustable drawstring delivers a personalized fit, and a fly opening is always convenient for late-night trips to the bathroom. 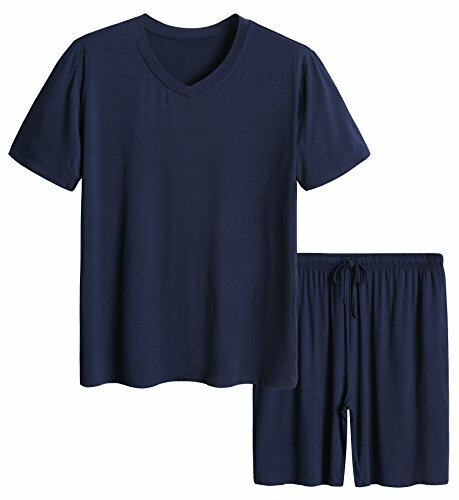 Classic, cozy and comfortable, this 2-piece Men's Pajama Set is bound to be an all-time favorite. Prints: Made of 100 percent cotton; Solids: Made of 95 percent cotton, 5 percent spandex Long sleeves Full-length pants Button front with collar and chest pocket Elastic, drawstring waist and fly Machine washable Imported Personalization and PajamaGram Free Gift Packaging are not available for this item. Material --- Light Weight Satin , Very Silky Feeling and Help you Have a Sound Sleep. Size --- S ,M ,L ,XL ,2XL ,3XL ,4XL , Almost Fit Everyone. Elastic Waist With Drawstring --- Comfortable and Relaxing Fit, Adjust it As you like. The Pants Has Fly Opening --- Humanized Design. Perfect as a Gift --- Retail over 40USD, Great Choice For your Husband, Boyfriend, Brother and Son as a Birthday gift and Great Present for Father Day, Valentine's Day and Christmas. Our irresistibly soft and cozy fleece pajama set makes perfect gift for yourself and or your loved ones. Our set features a front-buttoned, long sleeves top and a long pants is with elastic drawstring waistband, and 2 side pockets. This pajama set is sized quite generously for maximum comfort. 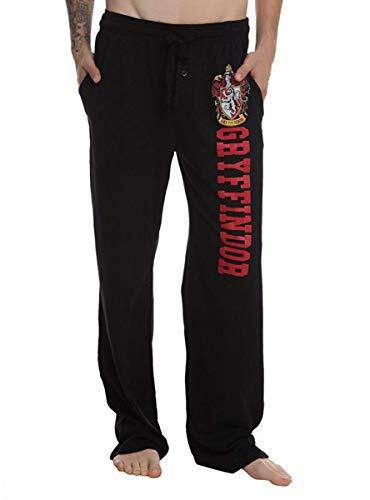 Brand new, officially licensed sleep pants for Harry Potter. 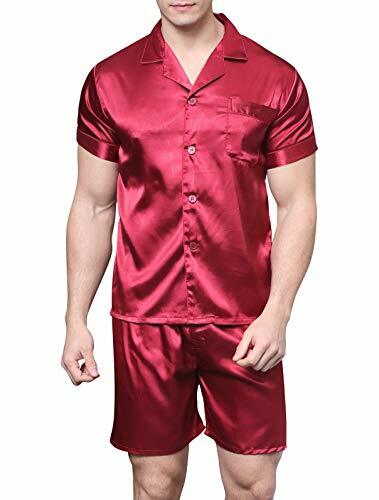 Premium silk-like satin pajama set for men, 100% polyester. Short sleeve top with one front pocket on chest. Elastic waistband shorts with one button fly. Light weight polyester satin with silky feel for comfy night sleep. Great gift for family or friend. Good choice for Father's Day gift. New dark colored fabric will lose floating color from its surface, especially black. We suggest you wash your new satin products before wearing. If possible, please use neutral detergent to wash, soap or alkaline detergent may increase fading. Wash separately or with like color, wash inside out can help protect fabric color. Hand wash below 30 Celsius Degree. Iron on low heat. For size guide, please scroll down to Product Description. Please do not only compare the size title (M/ L/ XL/ XXL) with your usual clothing, please read carefully each element of the size guide (bust, waist, length, etc.). Our 100% cotton flannel pajamas are soft, comfortable and relaxing. It offers an instant cozy sensation. 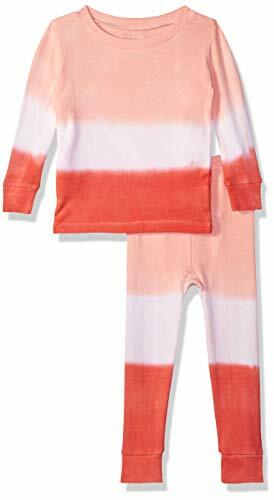 No matter it is for a wine tasting moment by the fireplace on a winter night or a fun game at a sleepover party, these pajamas slide you right into the moon light mood. The black red gingham pattern looks both classic and eye-pleasing. Pure soft natural cotton fabric. Go ahead, feel it, embrace it, and enjoy it. Wearing the naturally soft and smooth fabric to get the instant comfort and relaxation. The red black gingham pattern generates an both classic and casual appearance. Great gift for husband, dad, or brothers. Perfectly suitable for bedroom wearing in all occasions - home stay or on vacations. Quality was built in every detail - Elastic waist with drawstring in matching color; Buttoned fly in the front and hidden pocket on each side. The material is comfortable and feels luxurious. Great summer short and shirt set for really hot days.